Marjorie Marie (Cinnamon) Horn was born on December 29, 1933 to Ralph Liberty Cinnamon and Celia Alice (Johnson) Cinnamon at home northwest of Perry, OK, in the Polo community. She passed from this life on October 7, 2018 at Perry, OK. She was 84. She attended many one-room schools where her mother taught. Then she lived with an aunt in Garber, where she attended school. She graduated from Perry High School, after a bus route was established. 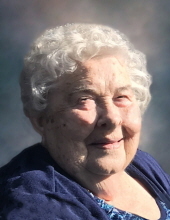 Marjorie then attended a business course in Ponca City, OK. She worked many jobs throughout her life. She became a deputy in the Noble County Clerk's office in 1976, where she retired in 1998. To send flowers or a remembrance gift to the family of Marjorie Marie Horn, please visit our Tribute Store. "Email Address" would like to share the life celebration of Marjorie Marie Horn. Click on the "link" to go to share a favorite memory or leave a condolence message for the family.